I stumbled upon the following hadith, but I was unsuccessful in verifying it actually exists, and am unable to gauge its authenticity. 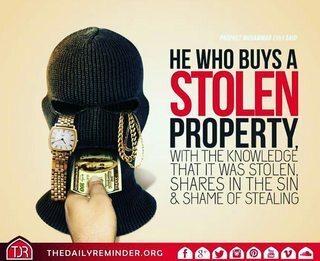 It is reported that the Prophet sallallaahu `alayhi wa sallam (may Allaah exalt his mention) said: "Whoever buys something stolen while knowing that it is stolen, then he has indeed shared in its shame and sin." Question: Does the above hadith exist, and is it sahih?
" من اشترى سرقة ، وهو يعلم أنها سرقة ، فقد شرك في عارها وإثمها "
(like in al-Mustadrak) is: Muslim ibn Khalid مسلم بن خالد he was one of the teachers of imam a-Shafi'i (in fiqh and hadith) his hadith is rejected by al-Bukhari, ibn al-Madini and many ahadith among them this one also by imam a-Dhahabi. Abu Dawood considered him as da'if while ibn abi Hatim considered him as none to rely on, ibn 'Ady however said his hadith is Hassan and hopefully fine, ibn Ma'yn considered his hadith as acceptable ليس به بأس. A-Dhahabi nevertheless added in his siyar 'alam an-Nubala' سير أعلام النبلاء a comment saying that some scholars consider his hadith to be close to Hassan. Note that al-Hakim himself considered the chain as on the conditions of al-Bukhari and Muslim and the hadith therefore as sahih, and in his opinion the issue might have been with Sharhabyl شرحبيل whom he called ibn Sa'ad al-Ansari ابن سعد الأنصاري a mohhadith whom imam Malik firstly rejected and later accepted (according al-Hakim). Note that others consider Sharhabyl as weak too. should be clear as the hadith has a clear disconnection. Hisham ibn 'Obayd Allah from ibn Lahi'a (al-Masri) from Ishaaq ibn abi Farwa from abi Salaah from abu Hurraira. includes ibn Lahi'a ابن لهيعة in the chain whom is considered as weak (according my source without quoting any evidence) and Ishaaq ibn abi Farwa إسحاق بن أبي فروة is also a rejected narrator. but I'm not the right person to judge or qualify it. From the above we may conclude that all three chains have issues, maybe the first would have less according some scholars. Sources: Beside siyar 'alam an-Nubala' on islamweb I rely a lot on this Arabic thread. Not the answer you're looking for? Browse other questions tagged hadith authenticity theft or ask your own question. Who decided that the 6 Sahih Hadiths were reliable? Is this a sahih hadith: “They are those who accumulated wealth without differentiating between lawful and unlawful…”? Is the Hadith Sahih “The World is a Prison of the Believer and Paradise for the Kafir”? Is (or was) there a school of Islam that accepts both Sunni and Shia hadiths?